SIR William Stanier formally recommissioned Sentinel 4wVBT William (9959/1956) back into Elsecar Heritage Railway traffic on March 26 as a highlight of the line’s Sentinel Gala. The re-enactment replayed events of 60 years ago when the real Sir William, then a board member for the Courtaulds empire, formally named William at the Courtaulds Fibre factory at Great Coates, near Grimsby. At Elsecar the role of Sir William was played by Mick Langan, the well-known former LMS chief mechanical engineer having passed away in 1965. William is now owned by Mike Hart and has recently been the subject of an extensive overhaul that has seen the boiler rebuilt and the body styling modified to lose the classic angular look of the later Sentinels. With the bonnet top removed the loco’s cylinders are now uncovered, creating visual similarities with Mr Hart’s other Elsecar-based Sentinel, Gervase (6807). William has been finished in lined black livery with LMS on the body sides. Both William and Gervase handled a range of passenger and freight turns throughout the day, joined by Sentinel diesel Elizabeth, which until 1965 was also a steam loco similar to William. A fourth Sentinel – No. 9376 of 1947 – was also available for the public to view, who could sample the new commemorative ‘William’ beer from Sheffield’s Sentinel Brewing Company. 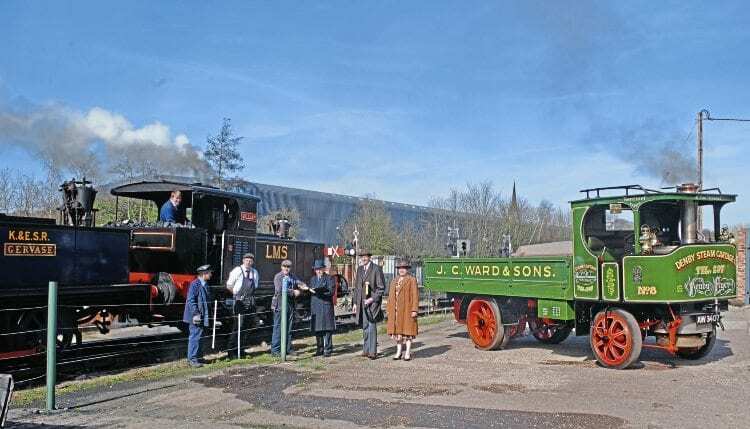 To complete the gathering, one of Sentinel’s famous steam waggons, ‘S4’ Denby Flyer, built in 1917, had been brought to the gala by owners J C Ward & Sons of Denby Dale.